The market remains strong although it should be in a short-term downswing inside the 3-month uptrend channel. 9/10/2012 is the projected reversal day to change from a downswing to an upswing. 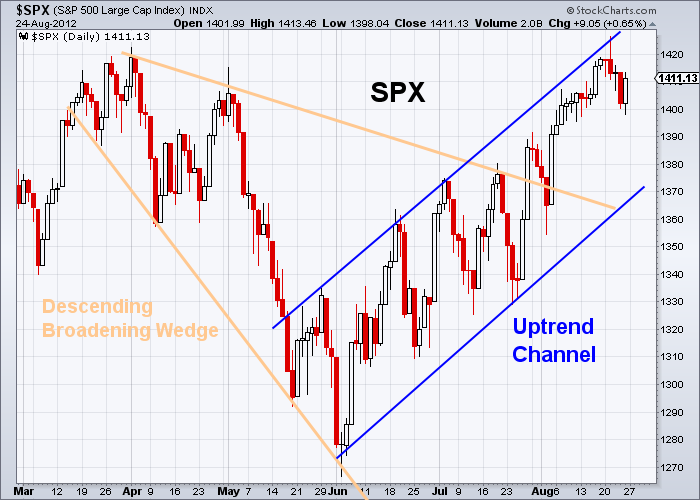 The S&P 500 index is in a 13-week Bullish uptrend channel. 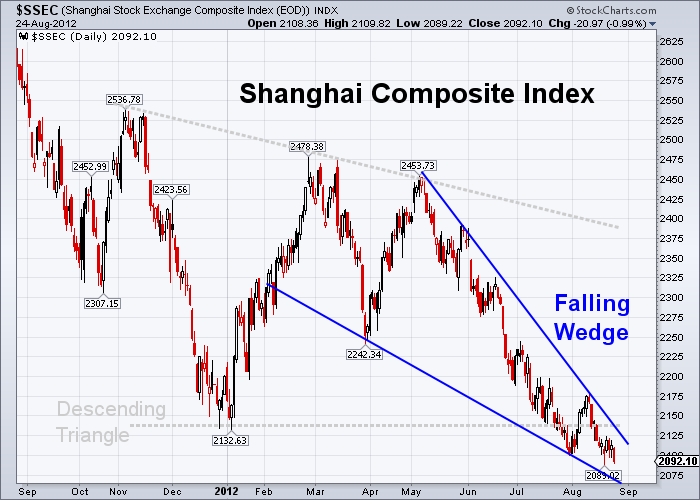 Last week, the index briefly reached 1420, the price target projected from the 15-week descending broadening triangle. 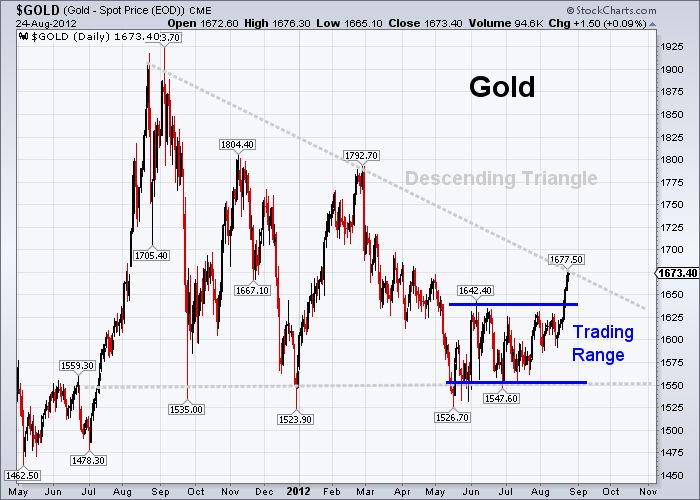 Last week the gold index broke to the upside from the 12-week trading range between 1550 and 1630. 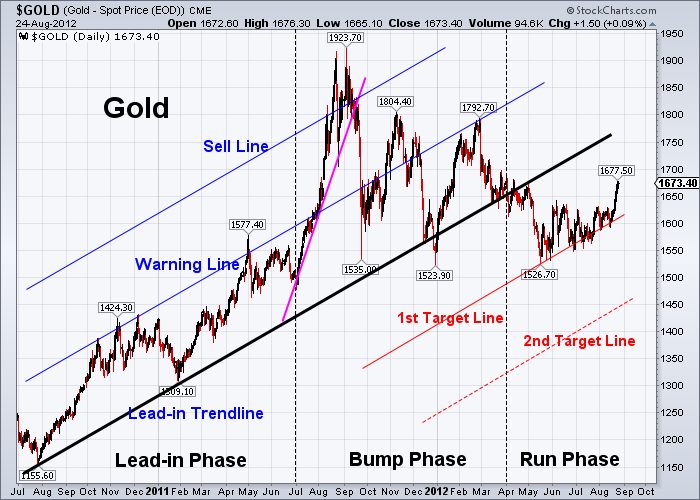 It is a bullish sign for gold. 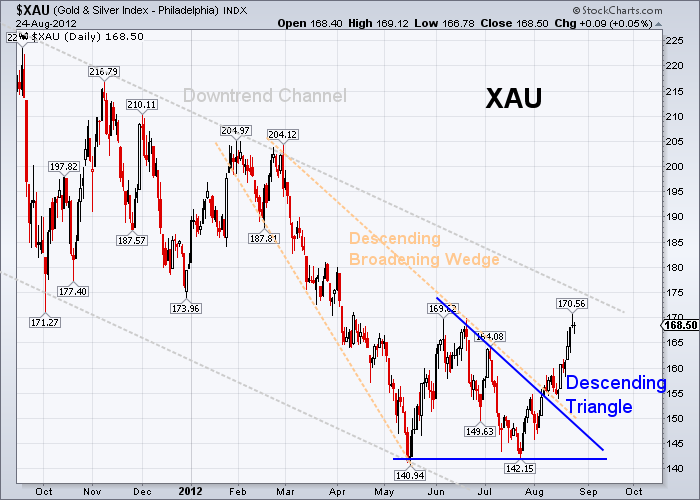 Now gold is going to test the upper boundary of the 12-month Descending Triangle pattern. If prices are able to further break through the upper boundary of the triangle, gold could become intermediate-term bullish. 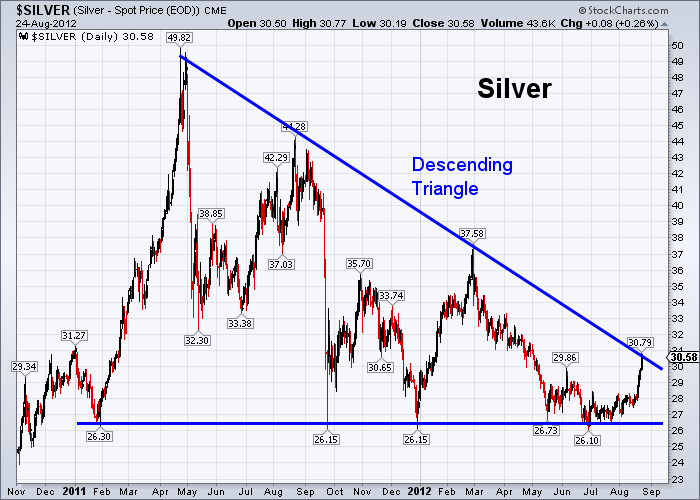 Silver is going to test the upper boundary of the 12-month Descending Triangle pattern. If prices are able to further break through the upper boundary of the triangle, silver could become intermediate-term bullish. After the bullish breakout from both the 10-week Descending Triangle and the 6-month Descending Broadening Wedge, gold mining stocks had a good advance. 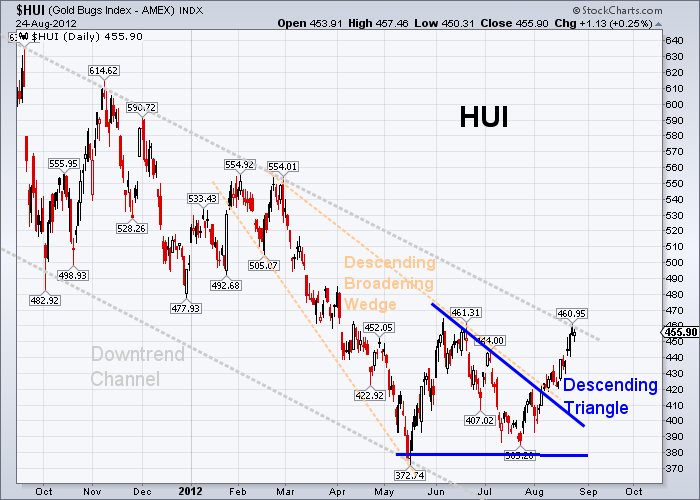 Last week their price targets were reached, 170 for XAU and 450 for HUI. 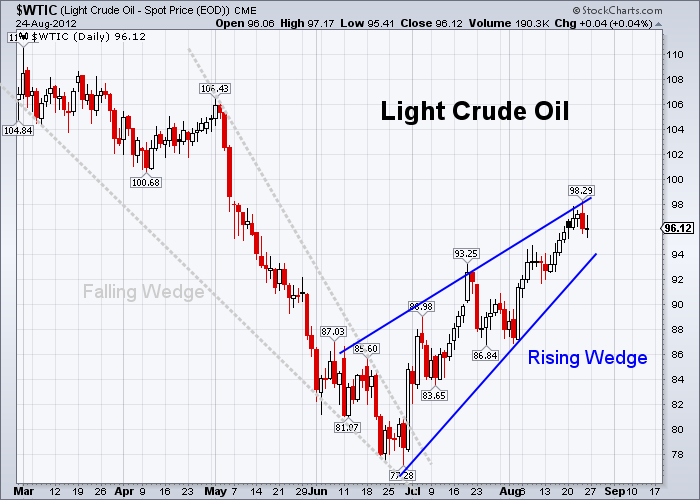 Crude oil is forming an 8-week rising wedge. The US dollar index is still in a consolidation. It broke down from the 2.5-month uptrend channel last week. 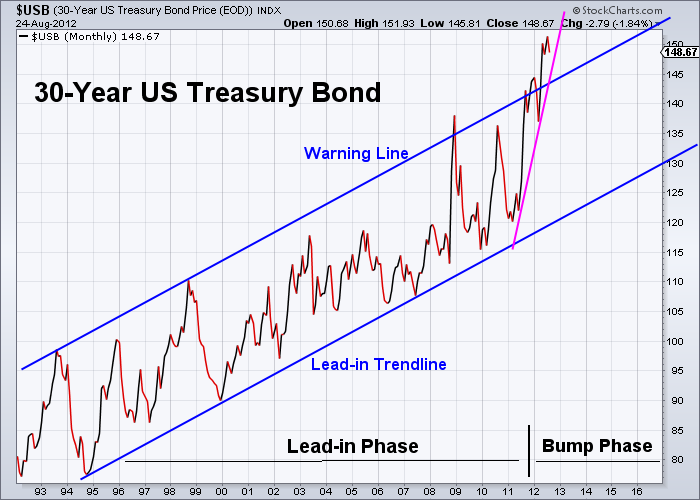 It may test the lower boundary of the 10-month uptrend channel. The following table is the percentage change of each asset class (in ETFs) against the 89-day exponential moving average (EMA89). Currently the U.S. stock market and gold are outperforming. 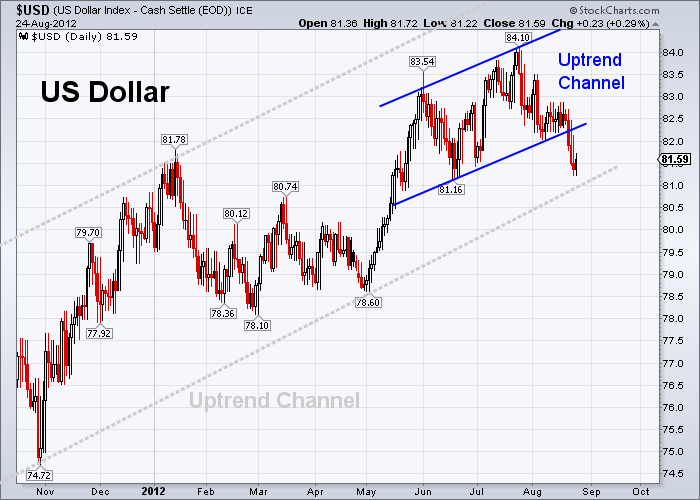 the U.S. dollar is underperforming. The following table is the percentage change of sectors and major market indexes against the 89-day exponential moving average (EMA89). 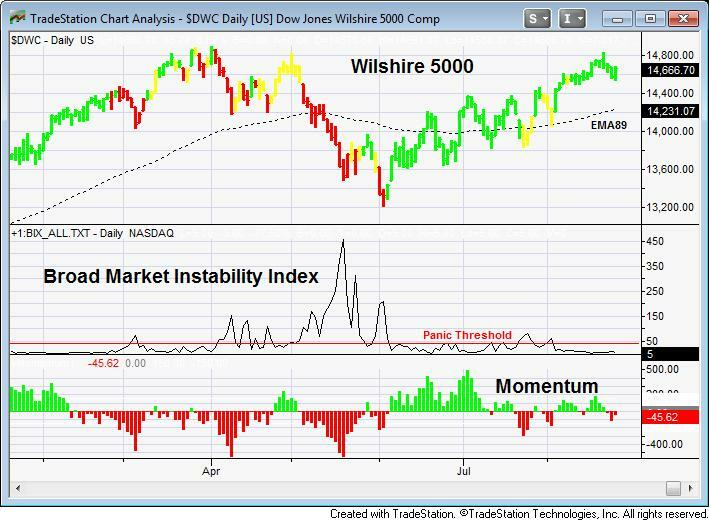 The Dow Jones Wilshire 5000 index, as an average or a benchmark of the total market, is 3.06% above the EMA89. Outperforming sectors are Biotech (8.24%), Telecommunication (4.60%), and Technology (4.55%). 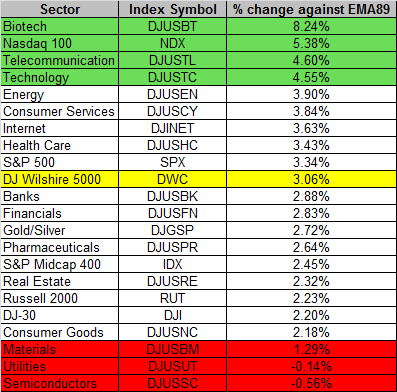 Underperforming sectors are Semiconductors (-0.56%), Utilities (-0.14%), and Basic Materials (1.29%). The NASDAQ 100 (5.38%) is outperforming the market, and the Dow Jones Industrial Average (2.20%) is underperforming.